"I refuse to join any club that would have me as a member!" I was thrilled to lean that in May Martha Stewart (or Miss Martha as they'd call her here in the South) will be launching a new line of paper based craft products at Michaels. The line will include such items as paper, punches, stamps and stickers along with albums and paper crafting kits. Just another exciting thing to look forward to during my Birthday month. In the fall the line will be available at independent craft supply retailers. 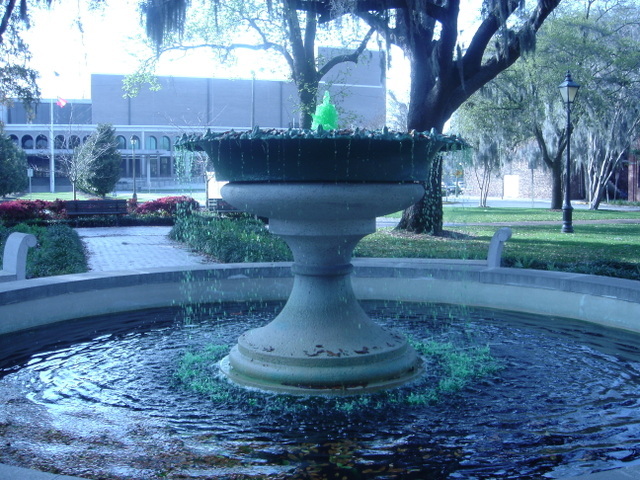 As I walk to work I pass this fountain which is now a kool aid shade of green in honor of St. Patrick's Day. Since it is my first St. Patrick's Day in the city which claims to hold the second largest St. Patrick's Day parade, I suppose it's my duty as one of the Irish to participate in some way. My options are get lost among the debauched tourists trying to out drink one another. Or I could stay closer to home and put in an appearance at a party being thrown by my downstairs neighbor at the townhouse. That's a tough one. Last night I attended a book signing at One Fish Two Fish. 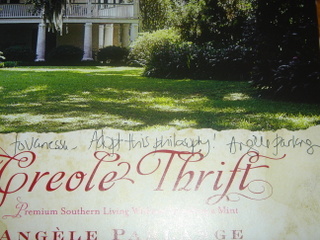 The author, Angèle Parlange, was signing her new book Creole Thrift: Premium Southern Living Without Spending a Mint. Here's the premise: "Our most interesting and cherished possessions are not always our most expensive; they are the unusual decorations that tell a story— the irreplaceable antiques or heirlooms that express history and heart. With ingenuity and an open mind, famed New Orleans designer Angèle Parlange sees potential in the offbeat yet sentimentally valuable. Using an eclectic array of heritage pieces, garage sale treasures, and unusual items that simply spark her interest, she creates quality pieces for the home that are as gorgeous as they are distinctive. In this stunning book filled with project ideas, recipes, whimsical stories, and enchanting "Creole Expressions," Parlange describes how she created some of her favorite designs— from a fabric pattern inspired by her ancestors’ 1830s calling cards, to a shower curtain based on a seventy-year-old college football program. Raised on Parlange Plantation, a national historical landmark in Louisiana, Parlange draws from her Southern heritage in both design and way of life. In a voice as charming as her signature style, she shares tips from her "Creole Thrift" philosophy that you can live first-class without spending a fortune, simply by being resourceful." Beyond being visually stunning, the book is also packed full of stories and tips on how to incorporate Angèle's design ideas into your own home. I'm actually really excited to work in a southern design aesthetic into my own apartment. When I arrived home after the signing, despite having to rise early this morning for a new job, I stayed up into the wee hours devouring Angèle's book. Today Angèle was still in Savannah and did a bit of shopping at the new shop I'm employed at. I got the opportunity to tell her in person how smitten I am with her book. Trust me, you'll love it too. 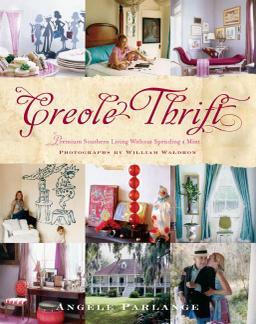 And if you're ready to inject some new design ideas into your home this spring might I suggest finding inspiration from Creole Thrift: Premium Southern Living Without Spending a Mint. 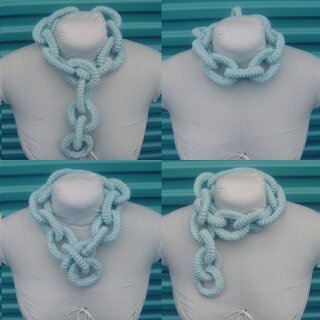 As a scheme for acquiring some extra cash during my graduate school days I've decided to open a shop on Etsy where I will be selling my knit chain link scarves. Apparently they're all the rage in London, as evident by the display window below. But as of yet I have not seen anyone sporting this trend here in the states. So to facilitate their popularity here I've decided to start selling my own version. If you're interested, please check out my Etsy shop, although I am sorry that it's currently on the anemic side (only two items). I have several more scarves I will be adding in the upcoming week. The scarves can be worn a variety of ways, several are shown in the pictures above. I should also mention that If anyone is interested in a specific color not available at my shop please contact me and I can accommodate your color preference. As well, if you'd like a longer scarf that can be arranged too, but there will be an increase in the price. Also, the prices of the scarves vary due to the price of each skein of yarn. I know they're a little unusual looking, but I do get plenty of compliments because of that fact.